Since it opened its enlarged locks, the Panama Canal has won back all its market share of Asia-US east coast container traffic. According to The Loadstar’s latest LongRead, the ability of lines to move far larger ships through the waterway’s locks, coupled with cut-price tariff incentives by Panama on the return leg of the journey, designed to encourage lines to convert round-the-world services into Asia-US East coast pendulum services, the canal has been successful at reversing the shift of vessel loops to Suez during the last five years. 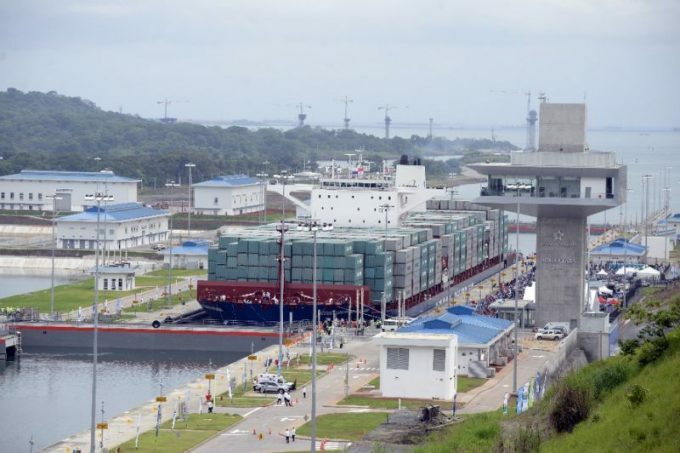 “The performance of the locks has fulfilled and exceeded what we expected for the first two years,” said Silvia de Marucci, executive manager of the Panama Canal Authority’s economic analysis and market research division. The canal’s share of this all-important tradelane – which represented 34% of its total traffic in fiscal year 2018 (October-October) – has fluctuated between a high of 57% in 2009 and a low of 11% when the canal was handed over by the US to Panama in 1999. The intermodal landbridge that links the west coast ports of the US and Canada to the east coast hinterland has seen its market share decline from a high of 86% in 1999 to around 31% currently, while Suez has seen its share slip back since the opening of the new locks in Panama. Prior to the expansion, the largest ships that could transit the canal were first-generation panamax vessels with a maximum 32.3-metre beam and 12-metre draught, equating to no larger than 5,100 teu capacity – small by current industry standards and no longer considered viable to operate in many major deepsea lanes. Operators are now able to deploy neopanamax vessels up to 365 metres length, 48.8 metres beam and with a draught of 15.2 metres and, depending on the detailed specifications, ships of around 13,000 teu nominal capacity – representing a paradigm shift for the industry. Francisco Crespo, Maersk marine manager for the US east coast, said Panama offered much more than just an old-fashioned shortcut for shippers and lines. “There are the obvious attractions of being able to move larger ships via the canal, but are there other secondary advantages of its widening. The positive impact of cargo consolidation in Panama and other areas in the region that have made this route more attractive than alternative routes like Suez. “The fact is that, having the ability to deploy larger ships through the Panama Canal has allowed Maersk Line to move bigger vessels from certain origins in Asia to the US east coast/Gulf. With 32 feeder services linking Panamanian ports to other hinterlands, like the east and west coasts of South America and the Gulf of Mexico, the canal has benefited from its proximity to key markets. However, the arrival of bigger ships hasn’t been the fillip to Panamanian ports it was expected to be. Combined volumes in Panama’s container terminals registered no growth this year, following a 10% increase in 2017. The flat throughput figures follow the disappointment of receiving no bids for a concession to construct a new box hub, Corozal Container Terminal, on land adjacent to Hutchison Port Holdings Balboa, when it was tendered by the Panama Canal last year. Maersk’s APM Terminals, MSC’s Terminal Investment, CMA CGM’s Terminal Link and Singapore-based PSA International were all expected to submit the required specifications for the 5m teu capacity terminal.